Is Ginger Safe With GERD? Gastroesophageal reflux disease, or GERD, can turn eating hot or spicy foods into a potentially painful experiment. 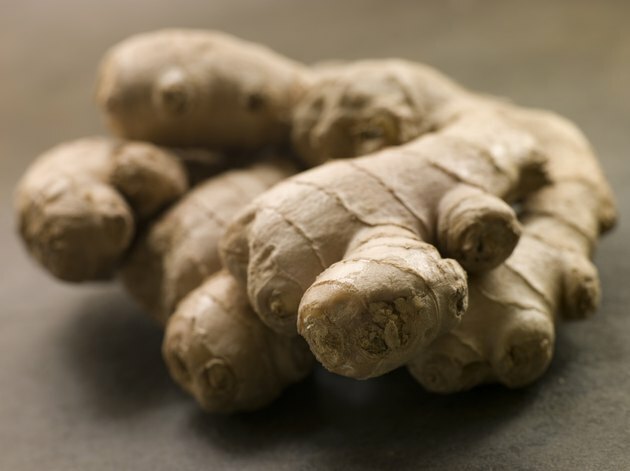 Ginger, a root herb that may be used as a seasoning or as an herbal remedy for nausea or indigestion, lends warmth and zest to foods and beverages. If your GERD symptoms include indigestion, taking a moderate dose of ginger may soothe your stomach. Ultimately, your decision to use ginger should be based on your body's responses to this herb. Consult your doctor about adding ginger to your diet as a seasoning or supplement. Although dietary factors do not cause GERD, some foods and beverages can make GERD symptoms worse by stimulating stomach acid production or loosening the lower esophageal sphincter, the ring of muscles that controls the passage of food between your esophagus and your stomach. When this sphincter opens at inappropriate times or doesn't close completely, stomach acids and partially digested foods can surge up into the esophagus, creating a burning pain in the center of your chest after you eat. Certain foods are likely to worsen acid reflux in people who suffer from GERD, but reactions vary from one individual to another. Spicy or greasy foods, citrus fruits and juices, tomatoes and tomato sauces, onions, chocolate, coffee and alcohol are common triggers for heartburn and indigestion. Peppermint, mint-flavored foods, black pepper and garlic are often associated with GERD symptoms. Although ginger lends a spicy flavor to foods, it is not typically included in lists of common triggers for acid reflux. Ginger root has been used as a remedy for digestive complaints in the healing traditions of India and China. Ginger tea and powdered ginger supplements may help relieve nausea, vomiting or indigestion. According to the University of Maryland Medical Center, taking 2g to 4g of fresh ginger root or chewing a 1/4-oz. piece of ginger root may soothe an upset stomach. In the amounts typically used in cooking, ginger produces few side effects. However, ginger may cause heartburn, belching or indigestion when taken in large doses. If you are using ginger as an alternative remedy, taking the herb in capsule form may prevent these reactions. Before you take ginger supplements, consult your doctor about potential gastrointestinal side effects or medication interactions. Small quantities of fresh ginger root can lend a potent, exotic flavor to pasta dishes, soups, salad dressings and other foods. If you enjoy the flavor of ginger and it doesn't aggravate your GERD symptoms, use moderate amounts of the fresh or dried herb to season foods. The therapeutic dose of 2g to 4g of freshly grated ginger root equals 1 to 2 tsp. when cooking. Your total consumption of ginger in foods, beverages or supplements should not exceed 4g, or 2 tsp. each day to avoid digestive side effects.